It is well known that Felix Mendelssohn's sister Fanny was a highly talented musician, but fewer are familiar with the fact that there were two other musical siblings in the Mendelssohn family: Rebecka, a gifted singer, and Paul, a very competent amateur cellist. It is to Paul, a banker by profession, that we owe the existence of much of Felix's music for the instrument, which in spite of Beethoven's endeavours hadn't yet become firmly established as a duo partner of the piano. 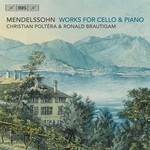 Fitting comfortably on a single disc, Mendelssohn's works for cello and piano are here presented by Christian Poltéra and Ronald Brautigam, who open with the Variations concertantes in D major, composed in 1829. Brautigam has recently released the composer's Lieder ohne Worte, performing them on a copy of a piano by Pleyel from 1830, and plays the same instrument on the present disc. Meanwhile, Poltéra has chosen to equip his 1711 Stradivarius cello with gut strings, and together the two musicians and their instruments create a sound which is both flexible, transparent and vigorous - ideal for Mendelssohn's scores. The two substantial sonatas, composed in 1838 and 1843, are separated on the disc by a brief 'Albumblatt' and a Romance sans paroles in D major, the only 'song without words' that Mendelssohn wrote for two instruments rather than piano solo.